As I’ve said before, I’m tough on Twitter because I love the service. Twitter is more than a broadcast tool for me. It’s a way to discover interesting people who I might not otherwise meet, especially those who take the time to follow me. However in the latest iOS update, Twitter made a subtle change that sacrifices its meritocratic spirit and emphasizes the scoreboard aspect of follower count. The screens above are the paginated view of a Twitter profile. When you click on an individual in the feed you’re taken to the screen on the left which displays their picture, potentially a background image and then prominently, their count of Tweets, Following and Followers. Images are nice looking but for the average person who I don’t know, tell me very little about who they are. 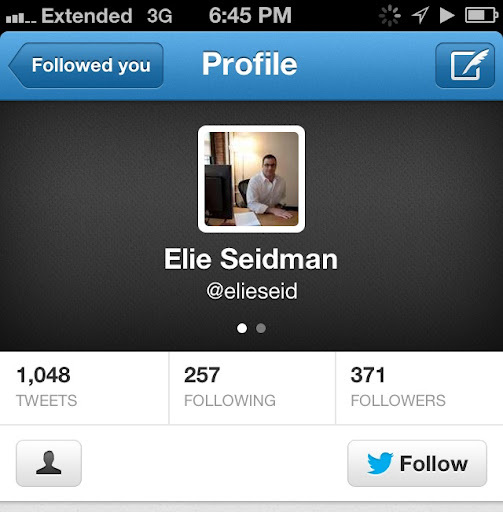 For example, some guy named Elie who seems to be sitting at a desk. No background image. And his follower count is really low. Snooze, I guess this guy is some loser, next. 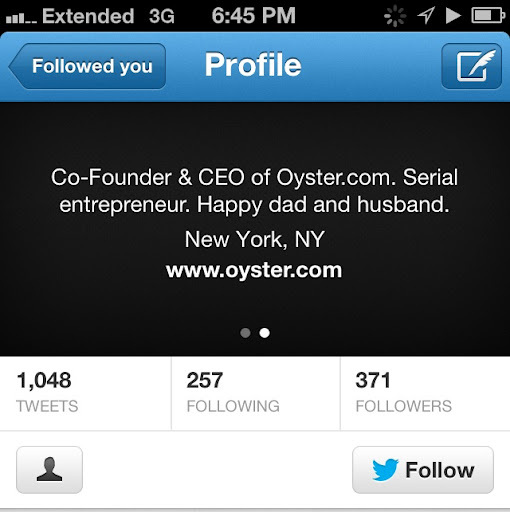 But when I swipe over to see his bio… Oh cool, he’s the founder and CEO of a company I’ve heard of (Oyster – a travel startup) and he’s located in New York, a place I visit often for work and family. Hey he could be interesting and maybe I should follow him too. Or message him and we can grab coffee next time I’m in town. BUT NONE OF THAT HAPPENS BECAUSE THE BIO IS HIDDEN BEHIND A SECOND SWIPE. I’d love to hear some of the design thinking from Twitter on this one. To me it emphasizes pictures and follower count, both of which are more important to branded or celebrity accounts. Even if unintentional, this changes makes Twitter a bit less human for me and more about accounts where the entity would already be recognizable (Lady Gaga! NASCAR! Odwalla!). C’mon Twitter – bring bio back to the default view!